I finally started working on this project for me -- a Lazy Girl Designs Miranda Day Bag. So far, I have cut out all the pieces for the cover, lining and pockets. 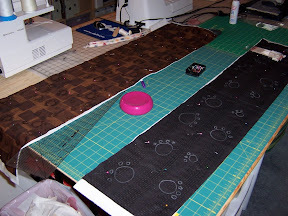 I am using the pawprint fabric purchased at the QuiltFest for the main cover, a coordinating black/brown print from JoAnn Fabrics for the bottom and main lining and I decided this project was worthy of cutting into my Westie Faces fabric, at least for the inside pockets. I want this to be a semi-whimsical bag -- just formal enough on the outside from a distance, but with a not too obvious bit of silly westie charm up close. I stopped working when it came time to quilt the cover pieces -- as I have said many times, I'm not a quilter, so I didn't know what design to use or how to quilt this fabric. A diamond pattern didn't seem right and neither did channels or stippling because it would work against the print design for my cover. All the Miranda samples online seem to have very little quilting on them, just enough to enhance the fabric and stitch the cover fabric to the batting. Then I remembered I had purchased a foot for doing free motion quilting when the Viking Sewing Gallery at West Nyack was closing last December. Maybe I could quilt paw prints using free motion? So I started drawing paw prints in chalk on my bottom fabric and thought I would just follow the outline of either the paw prints or boxes on the main cover. Later, I remembered I have westie stencils (intended for painting) and a cookie cutter that would probably work just as well. So now my plan is to free motion quilt the paws on the main cover print, then trace some westies on the black bottom cover (after erasing the chalk paw prints). I need to do a few sample pieces first, but at least now I have a plan. 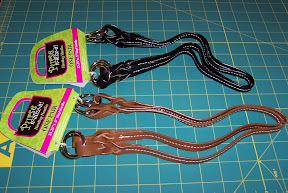 I'm leaning towards the black handles, because they repeat the black from the bottom cover and lining fabric. But first I need to finish my pants . . . Your Miranda is going to be wonderful! I love your fabrics and either of the handles will be great. I can't wait to see your new creation!